The Templates tab is where you can create and manage custom barcode label templates, which can be used to print any of labels available in the other tabs. The first panel on the tab will show the printing tasks you've queued (and the quantity of labels for each task), as well as settings for the barcode and label templates. The second panel will show a table of the barcode templates available, along with options to add, edit, or delete templates. The custom label templates that you've created previously are laid out in a table. You can manage those templates with the Edit button or the Delete button, or you can create a new template by selecting the Add template button. Name: The nickname given to the template for your reference. Page Width: The width of the templated label. Page Height: The height of the template label. Per Page: The quantity of labels that you would like to print per page. 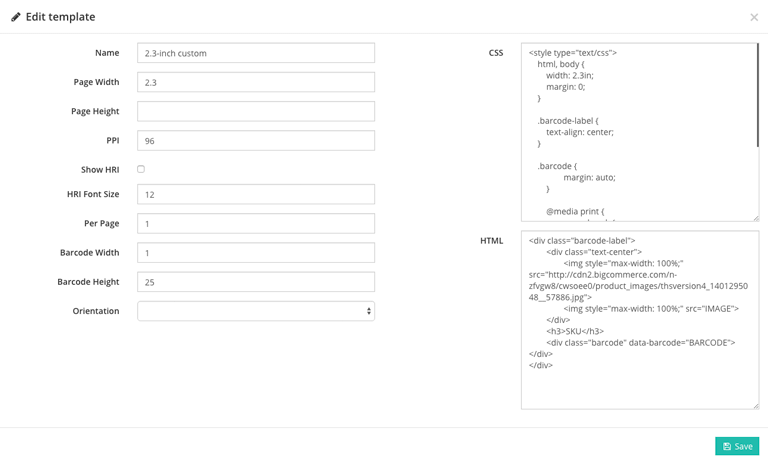 Adding or editing a template will present the same interface asking for the specifications for your template. There are a number of settings that determine the page size, barcode size, font size, and more, as well as areas where you can manage the CSS and HTML used to render the label. Note: Custom template design is an advanced feature and requires a working knowledge of HTML and CSS. If you are not comfortable with making changes to a template yourself, contact our support team by submitting a ticket with the label template specifications you desire. The following is a list of the variables that can be used in your custom templates. Note that the variables need to be entered exactly how they are shown here, including the capitalization (but not the ":" that follows each variable). TRUNCATED_NAME: The first 55 characters of an item's name. This is useful for small labels. RETAIL: The item's default retail order price. IMAGE: The main image associated with the item. QUANTITY: The number of labels for the item that was printed in the current print job.